Now, why does it not always work out to put fruit juice in your cold process soap? Lye is a strong alkali (ph 13-14), usually we use water which is neutral (ph 7) to make our lye solution. 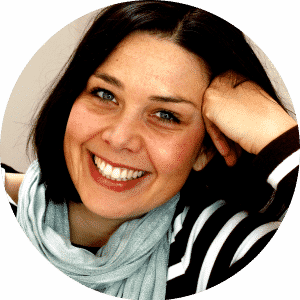 But what happens if we use a very acidic liquid, like let’s say lemon juice (ph 2), to mix our lye with? Well, not much happens at all, actually. The strong acidic (lemon juice) cancels out the strong alkali (lye), if you will. A sign of that is that your lye solution doesn’t heat up at first like it should. The soap batter might not emulsify or if it does, the soap will most likely not saponify leaving you with a very soft gooey mess. Back to our watermelon. Watermelon is alkali (ph 9) which is good news for us, because it means that our lye will (hopefully) work just fine and give us some lovely soap. Watermelon mostly consists of water and sugar. That means that we will have a nice fluid liquid to mix our lye in AND some lovely sudsy bubbles once the soap is finished, thanks to the sugar. 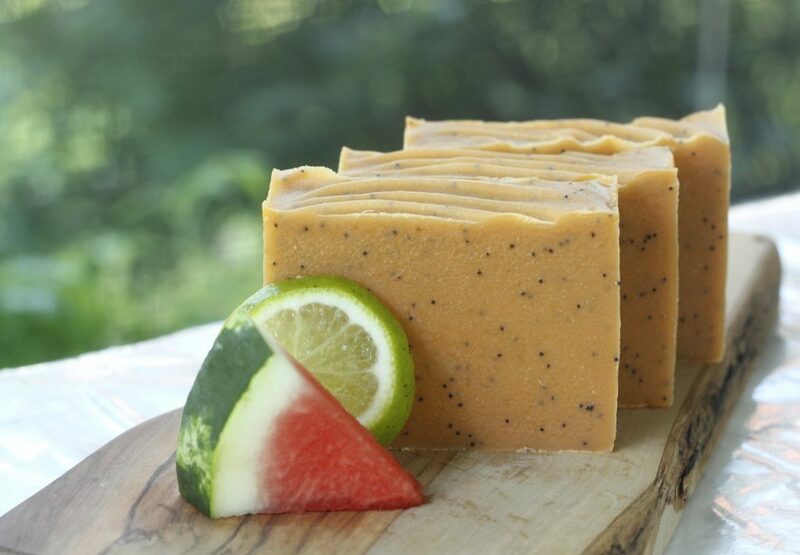 Are you excited to give the watermelon lime soap a try? I am. Let’s go! 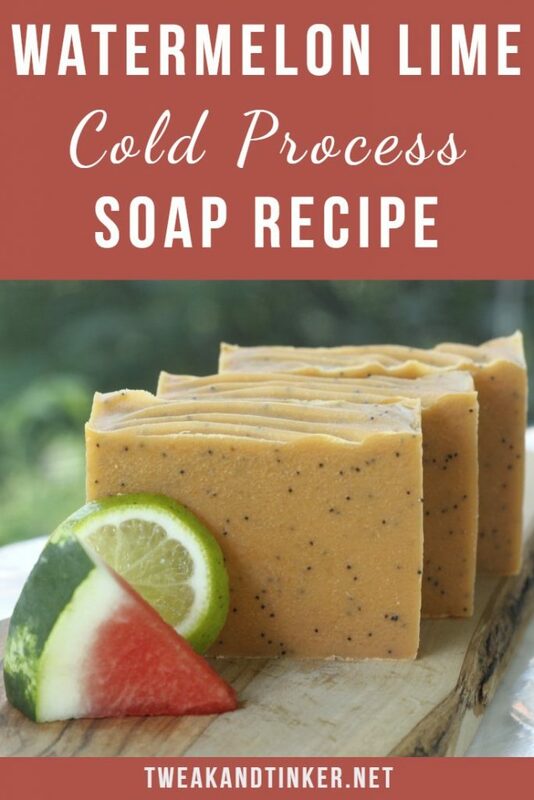 If you’ve never made cold process soap before, make sure to check out my posts on lye safety, my beginner’s tutorial and list of equipment needed. 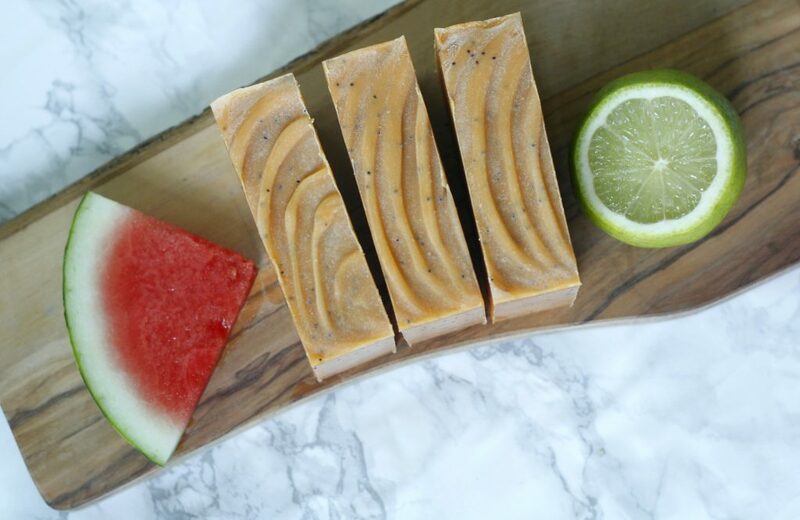 This recipe has been sized to make around 42 oz of watermelon lime soap (8 standard sized bars), you can resize this recipe to your heart’s desire using a soap calculator. Make sure to run every soap recipe you find online (including this one) through a lye calculator, just to be safe. This recipe uses a 35% lye concentration and is superfatted at 6%.